In 1994, the first U.S. state was still ten years away from legalizing gay marriage. Open homosexuality still led to discharge from the military under Don’t Ask Don’t Tell. And yet, in New York City, a nascent band of intrepid figures had already coalesced and begun the work of uncovering, documenting, and celebrating historic sites important to the LGBT community. These preservationists, operating as a sub-group of the Organization of Lesbian and Gay Architects + Designers (“OLGAD”), crafted a document called A Guide to Lesbian & Gay New York Historical Landmarks. 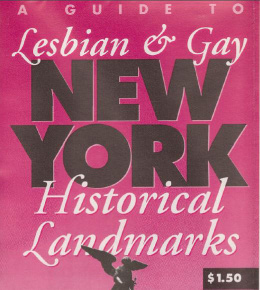 Featuring an image of the famous Angel of the Waters statue in Bethesda Fountain in Central Park (sculpted by Emma Stebbins) on its cover, the guide sought to provide a map and context for historical sites of importance to the lesbian and gay movements. The guide’s map did not materialize suddenly from thin air, however. It represented the fruits of an ongoing effort that had started earlier. “The map was a wonderful opportunity for the OLGAD preservation committee to put into practice what we had been discussing since 1992,” Ken Lustbader remembers. Lustbader joined the effort because he was busy at the time with his thesis—which explored the intersection of historic preservation and LGBT sites, using Greenwich Village as a case study. “I had felt pretty isolated working on my own, not knowing that there were a few others in New York City thinking about LGBT place-based history,” Lustbader said, noting that he was inspired by historian George Chauncey’s research on gay New York history. Dolkart recalls that another OLGAD group, Repo History, made up largely of artists, designed plaques relating to lesbian and gay history and related sites in Greenwich Village. These were installed on lampposts for a few months at the time of the Stonewall 25th. But the OLGAD map, being a little less ethereal, proved to be a quiet, continuing watershed of sorts. Action followed. “Andrew Dolkart included several LGBT sites in the published guide to NYC Landmarks,” Shockley noted, “and Gale Harris and I began, tentatively at first,to incorporate LGBT history into officialLandmarks Preservation Commission designation reports, in projects to which we were assigned, where appropriate.” As far as anyone can tell, this represented the first such effort at a local landmarks commission in the United States. The trio of Dolkart, Shockley, and Lustbader was part of a panel discussion at the National Trust 2011 conference in Buffalo and finally, in April 2014, “we met to discuss a more comprehensive project since the concept of LGBT cultural heritage had begun to take root in other cities,” recalls Lustbader. But Shockley noted that it took some time; even as the Landmarks Preservation Commission continued to amass LGBT history in landmark designation reports, the Commission didn’t designate an LGBT landmark specifically for LGBT reasons until after fie other cities in the U.S. had done so. “I was the firstperson to publicly, and internally, advocate for Stonewall to be designated,” Shockley recalls, “Stonewall was not designated a NYC Landmark until 2015, and is the only such LGBT-related Landmark.” The landscape remained a rather harrowing one. Then, when the National Park Service introduced its grants for the study of under-represented communities, the trio jumped at the chance to apply. “Receiving the first grant set us off on establishing the NYC LGBT Historic Sites Project, something that we had long hoped to establish,” said Dolkart. Today, Dolkart, Shockley, and Lustbader, the three co-founders of the Project, all remain very active in the effort. The groundbreaking work of OLGAD in the early 1990s continues to resonate in new ways in a changed societal landscape. The Project’s work moves forward with a strong sense of mission. “We’re hoping to educate the public on what definesLGBT cultural heritage beyond the obvious Stonewall history and showcase the sites that reflect the community influence on American cultur,” Lustbader emphasized.